What’s the role for developing countries in enabling sustainable transitions? The recent IPCC 1.5 degrees special report caused a stir globally as it revealed that the world has much less time before climate change becomes unmanageable. The summary for policymakers report says that ‘climate-related risks for natural and human systems are higher for global warming of 1.5°C than at present but lower than at 2°C’. Different regions of the world are projected to experience an increase in extreme events when global warming reaches 1.5°C and an even higher increase with a 2°C warming. For example, West Africa and the Sahel are projected to experience an increase in hot nights and longer heat waves with an increase in magnitude and frequency as warming approaches 2°C (table 1). Regional tipping points are also projected to be crossed. For example, agricultural systems for essential staple foods are expected to have a 10% reduction in productivity under a 1.5°C warming and a 15% decrease in production under 2°C warming. The report notes that even though mitigation and adaptation actions are being undertaken at different scales, incremental and transformational adaptation will be necessary to address future climate risks. Linked to the need for adaptation is the transition to zero or negative global carbon emissions. The report identifies the need to reach zero emission by 2050 if the global temperature rise is to be kept below 1.5°C and a zero emissions target of 2080 for a 2°C temperature rise . The IPCC report further notes that limiting temperature increase to 1.5°C will require a combination of measures such as reducing energy intensities, reducing resource extraction and use and employing mechanisms for the removal of carbon dioxide (like reforestation). Romani, Rydge  note that transition to a low-carbon economy is ‘recklessly slow’. Knowing the level of effort that needs to be exerted by different countries and groups to achieve these levels of emissions is therefore essential. The need to understand the level of effort required for transitions to a low-carbon economy then raises two critical questions –what is the role of developing countries and how much can they contribute to these reductions? To what extent are the developing countries willing to engage in the level of reductions necessary to keep global temperature rise below 1.5°C? The first question is relatively well understood. 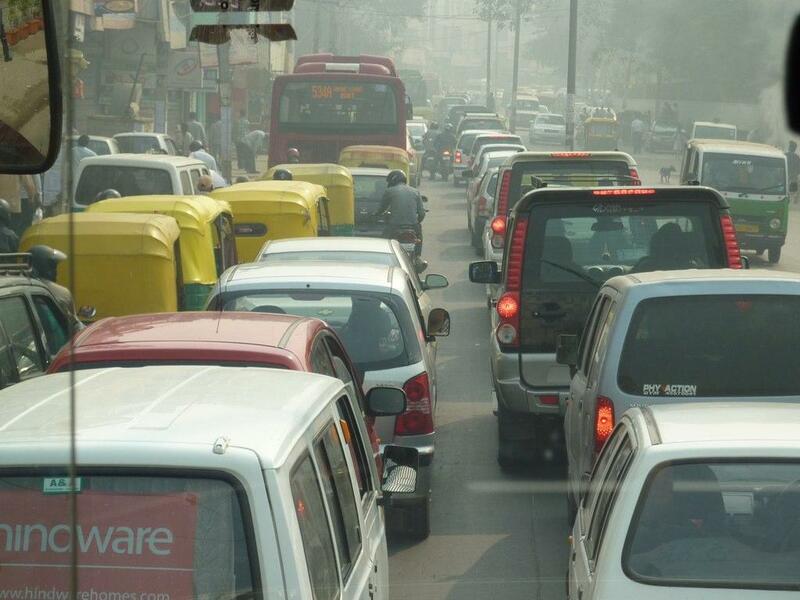 Developing countries have historically contributed little to greenhouse gas emissions. Most developing states require carbon-intensive investments to reduce poverty. For example, countries in East and South Asia and the Pacific which have reduced their levels of poverty have in turn increased their emissions over 200%, while regions like Sub-Saharan Africa (which have experienced increases in poverty) have in turn had decreases in carbon emissions . Developing countries like India, working towards poverty reduction, are therefore identified as some of the highest overall emitters. Some of the fastest growing cities are in developing states. With its high population growth, the developing world has the highest rate of increase in demand for energy. While some research shows that urbanization in developing countries is decoupled from industrialisation, suggesting a different trajectory for increases in carbon emissions , most research shows a positive correlation between these trends and emissions, especially for urbanization that has created higher energy intensities and higher energy carbon coefficients . Most low- and mid-income countries have almost the same energy intensity of GDP to CO2 intensity of energy ratio as high-income countries (figure 1). Developing countries are, on average, more energy intensive than developed countries . This ratio demonstrates the necessary role for developing countries in enabling transitions to the low-carbon economy needed to limit global temperature rise to 1.5°C. 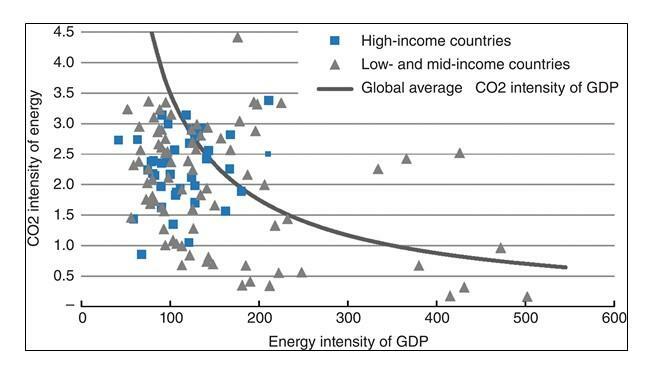 Figure 2: The energy intensity of GDP and Co2 intensity of energy for high income and low- and mid-income countries in 2011. Source: Fankhauser and Jotzo . These trends are leveraged by developing country governments and development actors to institute low-carbon mechanisms like green infrastructure and renewable energy systems that reduce energy consumption and GHG emissions. For example, Ethiopia’s investments in low-carbon infrastructure like hydropower and light rail are predicted to keep it on the path of becoming a low-carbon economy by 2025 . Adoption of low-carbon technology in developing countries, like Climate Smart Agriculture, is considered key to addressing both development and climate mitigation ambitions . Developing countries also have the most significant potential for renewable energy expansion . There is another question about the extent to which developing countries are willing to engage in transitions. The Paris Agreement was able to obtain country commitments towards self-identified contributions towards emission reductions. Since then, there has been progress by state and non-state actors in updating the commitments and setting up measures to ensure that commitments can be met. But are commitments by developing countries enough? Should developing countries be doing more? Their commitments have been applauded by many as the right move towards collective action. For example, the Paris Agreement has been highlighted to be a demonstration of the epitome of democracy, made up of ‘aspirational goals, binding obligations of conduct to mitigation, a rigorous system of oversight, and a nuanced form of differentiation between developed and developing countries’ . The Nationally Determined Contributions (NDCs) are a platform on which future climate action to reduce GHG emissions can be built. However, the current NDCs are insufficient to keep warming under 2°C . They have been identified as having modest ambition, with significant variations across countries with respect to efforts towards mitigation and adaptation . To achieve the ambitious emission reductions necessary for limiting warming to below 1.5°C, both developed and developing countries would have to pay higher costs . Further complicating matters, the achievement of the NDCs by developing countries has been framed as contingent upon availability of funding, which has so far been dramatically insufficient . So how can developing countries be motivated to engage in more ambitious emission reductions and transitions to low-carbon economies? One avenue would be to leverage developing countries’ interest and commitment to sustainable development. All developing countries have demonstrated their commitment to the SDGs by creating and implementing policies that will propel them towards reducing poverty levels. For example, most countries in Africa have established comprehensive development policies that have been used to direct the ambitious development projects that have been observed on the continent over the last decade. Creating linkages between sustainable development and low-carbon transitions can, therefore, be a way to increase developing countries mitigation ambitions. Northrop, Biru  note how some countries’ NDCs were able to be linked to the SDGs. However, they further note that not all countries comprehensively explored these linkages. This suggests the potential for the creation of linkages but also shows that few developing countries have been able to map out these linkages comprehensively. Creation of more ambitious mitigation targets and efforts will require evidence of how these efforts can be achieved in practice, thus shifting the focus from ‘whether the climate and sustainable development agendas can be mutually supportive, [to] how the potential mutual benefits can be maximized’. Another avenue would be to support developing countries to engage in transformative emission reductions. Transformative emission reduction options have the potential to produce greater and faster results. More ambitious efforts could include the elimination of fossil fuel subsidies , and novel technology options like soil carbon capture, which are currently not available in developing countries . Just like the linkages between low-carbon transitions and sustainable development, these transformative options will require evidence to show that they can work in developing country contexts. The focus on developing countries should however not take interest away from what developed countries can and should do to meet their 1.5°C warming targets. International policies calling for transitions to low-carbon development are required to be cognizant of the inequalities that underlie the global economic order, where developing countries are the most disadvantaged due to limited capacity and technology. To ensure that a balance between developed and developing county commitments and efforts is achieved, climate policies that encapsulate the different principles that have proven to be effective will have to be adopted. Some of these principles are reflected in the Paris Agreement and the SDGs which were able to bring together diverse actors to work on a common goal. By further linking Paris with the SDGs, the hope is that both the climate agenda and the development agenda can be realized. IPCC, Summary for Policymakers. In: Global warming of 1.5°C. An IPCC Special Report on the impacts of global warming of 1.5°C above pre-industrial levels and related global greenhouse gas emission pathways, in the context of strengthening the global response to the threat of climate change, sustainable development, and efforts to eradicate poverty, V. Masson-Delmotte, et al., Editors. 2018, World Meteorological Organization: Geneva, Switzerland. p. 32. Hoegh-Guldberg, O., et al., Impacts of 1.5°C Global Warming on Natural and Human Systems. , in Global warming of 1.5°C. An IPCC Special Report on the impacts of global warming of 1.5°C above pre-industrial levels and related global greenhouse gas emission pathways, in the context of strengthening the global response to the threat of climate change, sustainable development, and efforts to eradicate poverty, P.Z. V. Masson-Delmotte, H. O. Pörtner, D. Roberts, J. Skea, P.R. Shukla, A. Pirani, W. Moufouma-Okia, C. Péan, R. Pidcock, S. Connors, J. B. R. Matthews, Y. Chen, X. Zhou, M. I. Gomis, E. Lonnoy, T. Maycock, M. Tignor, T. Waterfield, Editor. 2018, World Meteorological Organization. Romani, M., J. Rydge, and N. Stern, Recklessly slow or a rapid transition to a low-carbon economy? Time to decide. Policy Paper, Centre for Climate Change Economics and Policy, Grantham Research Institute on Climate Change and the Environment, December, 2012. Goldstein, A., What is the link between carbon emissions and poverty? , in World Economic Forum. 2015. Vollrath, D., R. Jedwab, and D. Gollin, Urbanisation with and without industrialisation, in International Growth Centre Blog. 2016, International Growth Centre. Wu, Y., et al., The impact of urbanization on carbon emissions in developing countries: a Chinese study based on the U-Kaya method. Journal of Cleaner Production, 2016. 135: p. 589-603. Fankhauser, S. and F. Jotzo, Economic growth and development with low-carbon energy. Wiley Interdisciplinary Reviews: Climate Change, 2018. 9(1): p. e495. Okereke, C., et al., Governing green industrialisation in Africa: Assessing key parameters for a sustainable socio-technical transition in the context of Ethiopia. World Development, 2019. 115: p. 279-290. Neufeldt, H., et al., Scaling up climate-smart agriculture: lessons learned from South Asia and pathways for success. 2015, ICRAF Working Paper. IRENA, Africa 2030: Roadmap for a renewable energy future. 2015, International Renewable Energy Agency. Steckel, J.C., G. Schwerhoff, and O. Edenhofer, Enabling Low-Carbon Development in Poor Countries, in Sustainable Manufacturing: Challenges, Solutions and Implementation Perspectives, R. Stark, G. Seliger, and J. Bonvoisin, Editors. 2017, Springer International Publishing: Cham. p. 33-44. Rajamani, L., Ambition and differentiation in the 2015 Paris Agreement: Interpretative possibilities and underlying politics. International & Comparative Law Quarterly, 2016. 65(2): p. 493-514. Rogelj, J., et al., Paris Agreement climate proposals need a boost to keep warming well below 2 °C. Nature, 2016. 534: p. 631. Höhne, N., et al., The Paris Agreement: resolving the inconsistency between global goals and national contributions. Climate Policy, 2017. 17(1): p. 16-32. Hof, A.F., et al., Global and regional abatement costs of Nationally Determined Contributions (NDCs) and of enhanced action to levels well below 2°C and 1.5°C. Environmental Science & Policy, 2017. 71: p. 30-40. Hedger, M. and S. Nakhooda, Finance and intended nationally determined contributions (INDCs): enabling implementation. Overseas Development Institute. London, 2015. Northrop, E., et al., Examining the alignment between the intended nationally determined contributions and sustainable development goals. World Resources Institute, 2016. Merrill, L., et al., Fossil-fuel subsidies and climate change: Options for policy-makers within their intended nationally determined contributions. 2015, Nordisk Ministerråd. Wollenberg, E., et al., Reducing emissions from agriculture to meet the 2 °C target. Global Change Biology, 2016. 22(12): p. 3859-3864. 1.5°C: What’s the Big Deal?